Comments: While watching The Ape for the second time I found myself thinking not about the relative merits of this Monogram cheapie (which aren't significant) but about how many movies like this that were made circa 1940. For the sake of convenience let's call this horror sub-genre "mad scientist pictures"*. They follow a fairly rigid formula: a scientist is conducting unorthodox research that requires breaking one or more societal taboos (this might involve grave-robbing or otherwise desecrating the dead, or experimenting on unsuspecting innocents). How he reaches this decision varies. He might be overly ambitious. He might simply be a sociopath. Or he might be a moral man turned bad by a tragedy or a perceived injustice. In any case, the scientist justifies his actions by imagining that his bid to expand the frontiers of knowledge is worth the moral crimes he is committing. In the end the scientist receives a terrible comeuppance for these transgressions. Karloff alone did a slew of them for Columbia: The Man With Nine Lives (1940), The Man They Could Not Hang (1939), Before I Hang (1940), Black Friday (1940) , and The Devil Commands (1941). Lugosi did a number as well for the poverty-row studios: The Devil Bat (1940), The Ape Man, (1943) The Return of the Ape Man (1945), Voodoo Man (1944) . And there were many others ground out with other actors in the lead role, such as Face of Marble (1946) and The Lady and the Monster (1944). *I'm sure film historians have written more extensively about this sub-genre, and probably have a snappier name for it, but I have yet to read about it in any detail. These days we tend to think of medical research as a team effort: a broad network of academic, foundation and corporate sponsors combine to fund research that is open, collaborative and peer-reviewed. But in these movies science is depicted as something that occurs behind closed doors. The scientists in these films work alone, in drafty castles or dank basements or makeshift labs, without remuneration. They jealously guard their privacy. They don't seek incremental discoveries that others can build upon. Rather, they are looking for the big score: a cure for a disease, or for death itself. Frankenstein is the obvious precursor to these films, and some relatively big-budget productions of the 1930s toyed with the theme as well (e.g. The Invisible Ray). Then suddenly, for a few years starting around 1939, there was a torrent of mad scientist pictures. I'm not sure why. There don't seem to be any real breakout hits among these movies, and none of them can be said to have been particularly influential. Rather, the movies seem to rely on the lead actor's star power to draw audiences. They are quite low-budget, which helps ensure profitability; and they are very formulaic, which allows the scribblers at Monogram and PRC to grind them out quickly without making too much of a hash of things. The Ape is a textbook example of this subgenre. Curt Siodmak co-wrote the script (he's credited as "Kurt Siodmak" here), and unsurprisingly this movie prominently features spinal fluid, one of Siodmak's pet obsessions. It has the generally dingy look we expect from Monogram, as well as its share of Monogram idiocies: we discover that Dr. Adrian is wearing the "skin" of the dead ape, but in fact it looks like a full-blown ape costume -- which is of course exactly what it was from the beginning. The ape's behavior is, moreover, entirely un-ape-like. 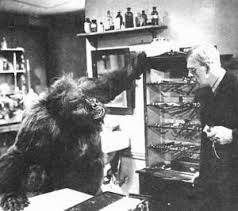 The movie does correctly point out that apes are frugivorous, but someone should have told Siodmak that apes are not nocturnal, not particularly aggressive, and do not have a tendency to break into people's houses and smash things. As the local physician, Matt nurses Lorna back to health. He is pleased to see her, even though she had stood him up at the altar years before. The other townspeople are not so forgiving, particularly Ruth Gibson (Ruth Ford) and Rev. Stevens (Otto Kruger). They resent what she had done to Matt, and remember that bad luck always seemed to follow Lorna, that everything she touched seemed cursed. The bus accident is only the latest proof of this: how is it possible that she walked away without a scratch, when everyone else was killed? Comments: We were just talking about one horror sub-genre (mad scientist pictures) and here comes another one: the Val Lewton knockoff, which flourished briefly in the mid 1940s. 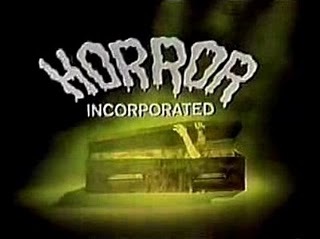 We've seen a number of them on Horror Incorporated, including Soul of a Monster, The Beast With 5 Fingers and She-Wolf of London. 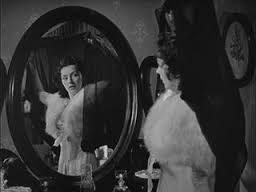 Lewton knockoffs try to emulate the moody and ethereal films that Val Lewton produced for RKO. 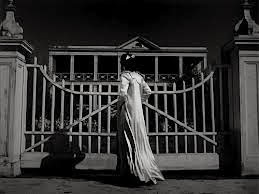 Lewton's films were understated, keeping the horror elements in the background, and part of the mystery was often whether the supernatural events were real, or merely psychological. The mystery was heightened by the dreamlike narrative and the slightly surreal camera work. And these kind of movies are relatively cheap to make, as they require very little in the way of special effects. Unfortunately, while it was fairly easy to imitate Lewton's films, it was nearly impossible to equal them. There's a subtlety and sophistication about them that was impossible to copy. That's exactly the case with The Woman Who Came Back. It just can't stack up to the movies Val Lewton made; but the good news is, it doesn't have to. Taken on its own terms, The Woman Who Came Back is a perfectly decent little thriller. The movie gets out of the gate quickly, with the old woman on the bus freaking Lorna out moments before the accident that kills nearly everyone on board. 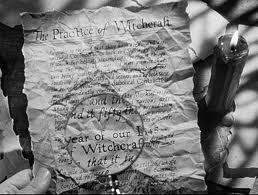 Because he is a doctor, Matt becomes the default 20th-century man of reason, telling Lorna that witchcraft and the supernatural were simply the products of ignorance and superstition. And yet ignorance and superstition persist in Eben Rock; and Matt must question whether his defense of Lorna is due to his steadfast belief in science and reason, or his rekindled interest in Lorna. Like The Ape, this is a movie in which small-town people are seen as an almost medieval assemblage of churlish busybodies. The difference here is that the deck isn't stacked quite as aggressively against them. We don't really know what Lorna's intentions are, and we are not convinced that she isn't in fact carrying a curse that threatens everyone in Eben Rock. Similarly, in spite of his kindly demeanor, we suspect that Otto Kruger's Rev. Stevens might be up to something sneaky himself. Nancy Kelly does a fine job as Lorna Webster. Kelly is best known as the mother of the evil child in The Bad Seed. 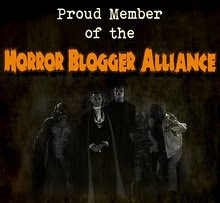 Three other actors familiar to Horror Incorporated viewers also share the screen here: John Loder (The Brighton Strangler) Otto Kruger (Dracula's Daughter) and Ruth Ford (The Man Who Returned To Life). Loder is perfectly cast, and he has a very authentic, easygoing way about him that quickly gets us on his side. I've talked about Ruth Ford before, and I'm quite taken with her here. She effortlessly conveys a tightly-wound woman with a somewhat conflicted agenda. 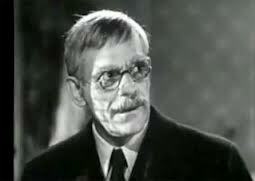 Kruger plays quite a different fellow here than he did in Dracula's Daughter (where he portrayed the psychologist torn between the affections of the title character and Marguerite Churchill's fetching girl Friday). He proves to be quite a versatile actor, and while I was sure I'd seen him somewhere before it took me a while to place him. 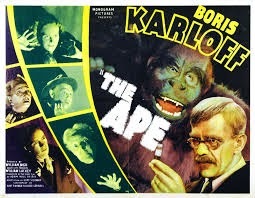 Never cared much for THE APE, whose sole attribute is that it serves Karloff better than THE APE MAN served Lugosi (only one murder victim in gorilla guise). Still, I'd rather pop this one in than WOMAN WHO CAME BACK, which I actively loathe, in the same way as SHE-WOLF OF LONDON and THE BEAST WITH FIVE FINGERS, ripoff filmmakers without the courage of their convictions.